Although sprinklers are the most common form of landscape irrigation, the sprinkler is an inefficient way to water. Much of the water emitted from a sprinkler system evaporate into the air. This rate of evaporation increases depending on the heat, wind and size of the droplets. One way to water plants that is more efficient is to water them at the root zone using a buried drip irrigation system. 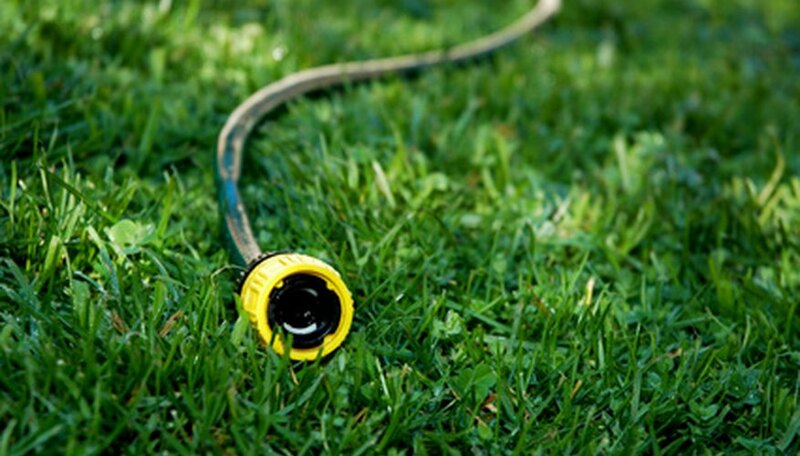 Drip irrigation may consist of soaker hoses or PVC pipe or a combination of the two. Dig trenches that are just a few inches deep through your garden for your drip irrigation system. The trenches should consist of straight rows through your garden that connect to a single trench that runs along one end of the garden. Assemble ¾ inch PVC pipe or connect soaker hoses together to fit inside the trench. The PVC pipe should be connected with three-way pipe connectors. Glue the pipes to the connectors using rubber cement. Connect soaker hoses together with a two-way hose splitter. Do not connect more than 100 feet of hose or pipe together. Drip irrigation pipe loses pressure after 100 feet. Place end caps over the ends of the pipe or hose. Drill 1/16 inch holes into the PVC pipe to drip water. The spacing of the holes will depend on what you want to grow. For corn or beans, add holes every 6 inches. For watermelon, tomato and pumpkin, holes should be spaced in groups of three, with each hole in the group 3 inches apart. Each group of holes should be 3 to 5 feet apart. Place the pipe or hose into the trenches and cover with soil. Plant your plants next to the trenches and mulch over them to prevent weeds from growing in the trenches. Connect a backflow preventer to your external faucet. Place a timer over the backflow preventer. Put a pressure regulator onto the timer and then attach a garden hose to the pressure regulator. Attach the other end of the garden hose to the underground irrigation system. Set your timer to automatically turn the sprinkler system on and off. You can connect a fertilizer tank with an injector to your irrigation system by connecting the injector between the pressure regulator and the garden hose. The injector will fill the water with liquid fertilizer for your plants.